The Network Extender is designed to be plug-and-play on most networks, the Network Extender Admin allows for monitoring and customization. The PC must have Internet Explorer 9 and above to access the web interface. Reference the device display to determine the device IP address. Press the button to the right of the display until the device IP address is visible. From a computer connected to the same network as the Network Extender, launch a web browser then navigate to the device IP address displayed. 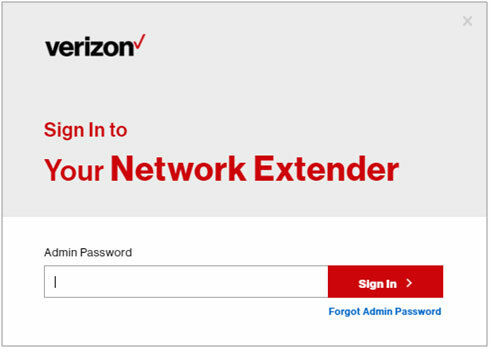 From the Network Extender Admin, click Sign in (located in the upper-right). The case sensitive default password: LTEFemto + the last 4 digits of the MAC ID (e.g., LTEFemto00A3). For forgotten password click Forgot Admin Password and enter the appropriate security question answer then click Submit (see Related Topics). 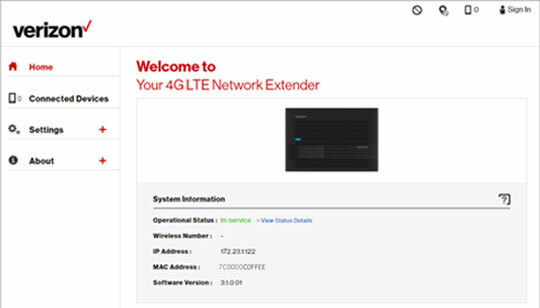 The Network Extender welcome screen is displayed with current device information.